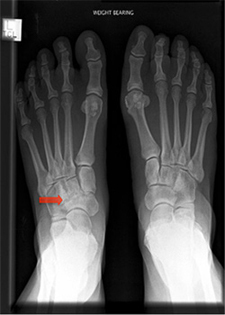 Arthritis in the middle part (arch) of the foot is very common. 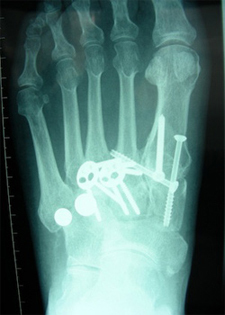 This condition often presents with pain, collapse of the arch of the foot and painful bony spurs on the top of the foot, which can rub in shoes. The arthritis is usually due to wear and tear (osteoarthritis) but can be related to previous trauma or inflammatory conditions such as rheumatoid arthritis. 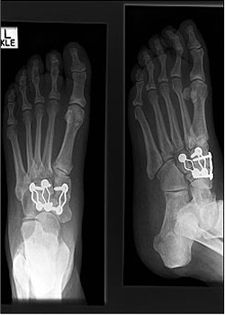 Non-operative management with custom insoles and carbon fibre-stiffened shoes is often effective in the initial stages. Unresolved or recurrent pain may indicate the need for surgery and this involves arthrodesis (fusion) of the affected joints. Careful attention to examination and appropriate investigations are vitally important in assuring a predictable result of treatment. 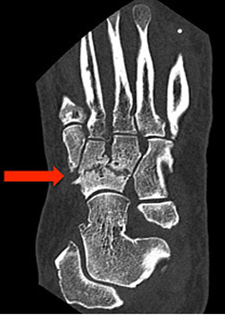 A CT scan confirms the arthritis in the midfoot joints – Loss of joint space is most marked at the naviculo-cuneiform joints. 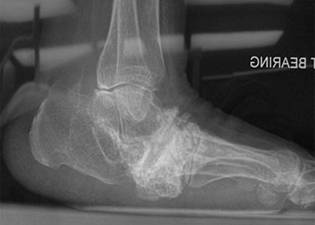 This X-ray show the foot of a patient with severe midfoot arthritis affecting multiple joints and causing collapse of the arch of the foot. 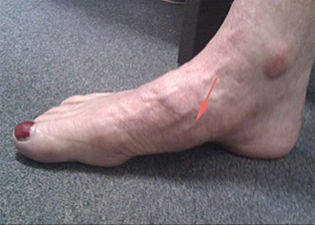 This can lead to bony prominences on the sole of the foot. 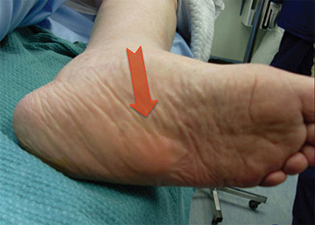 This picture illustrates the bony prominence evident on the sole of the foot. Careful attention must be paid to such prominences especially when they arise in weight-bearing parts of the foot. Inappropriate shoe wear or excessive pressure can lead to ulceration and infection.